Strange California editor Jaym Gates was interviewed for Women in Horror Month by Simon Dewar at his site. Click here to read the interview. Weirdly, it’s a Christian horror novel, “The Oath”, by Frank Peretti. I don’t know if it’s my favorite, but it certainly left a huge impression. Again, it’s not an obvious horror. The antagonist is this unbelievably big presence, but you don’t even SEE it until the very, very end. Before that, all the horror is straight from human nature. The antagonist is just a tool, and that’s really stuck with me. There’s no power as capable of evil as what’s already in us. The other one is “A Scattering of Jades”, by Alexander Irvine. I don’t know if it would still freak me out as much, but I read it when I was 15 and I wasn’t supposed to be reading that sort of thing…so I had to find somewhere I wouldn’t get caught. This is the point I tell you I grew up in the literal middle of nowhere, on an honest-to-goodness Native American archaeological site, in a region absolutely rife with supernatural weirdness. And that the safe place to read was our drafty old barn, in the near-dark, when I was supposed to head out into that special darkness you only get in the middle of nowhere so I could feed the horses. Oh, and both of these books played on darkness, open country, and buildings just like the one I was sitting in. 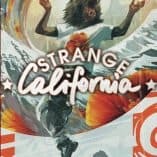 Check out the rest of the interview for more information on Jaym Gates, co-editor of Strange California.